Las Vegas: U.S. President Donald Trump said on Saturday he made the controversial decision to recognize Israel’s 1981 annexation of the Golan Heights after getting a "quickie" history lesson during a conversation on a different subject. “I said, ‘Fellows, do me a favour. Give me a little history, quick. Want to go fast. I got a lot of things I’m working on: China, North Korea. Give me a quickie,” Trump said to laughter from the Las Vegas crowd. Trump, who typically demands short sharp briefings and is known for his colourful retelling of stories, said Friedman was shocked, “like a wonderful, beautiful baby,” and asked the President if he would actually do it. Israeli Prime Minister Benjamin Netanyahu visited Trump last month. 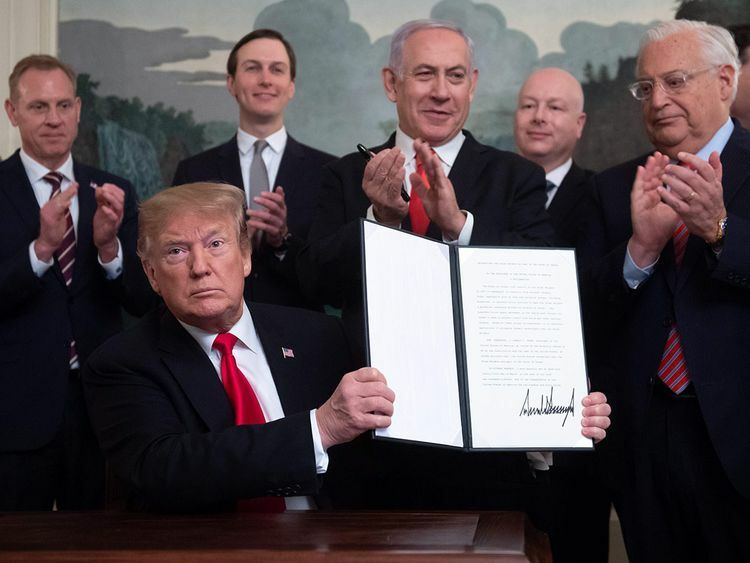 At their March 25 meeting, Trump signed a proclamation officially granting US recognition of the Golan as Israeli territory, a dramatic departure from decades of US policy. The move, which Trump announced in a tweet days prior, was widely seen as an attempt to boost Netanyahu who is up for re-election on April 9. Earlier three protesters stood on their chairs as Trump began to speak, shouting “Jews are here to say - occupation is a plague.” The rest of the crowd quickly drowned them out with chants of “USA! USA!” They were physically removed by security guards.